Compass Creative Dramatics offers a variety of 45-minute action-packed Jack and the Beanstalk-themed classes for the tiniest performers and explorers in your life! We help lay foundations for cooperation, empathy, social skills, and creative art appreciation. These classes stretch bravery and creativity muscles for 3-5 year olds. The week-long program culminates in an end-of-week showcase. Please note that students must be fully potty trained to enroll. 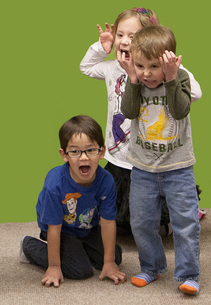 This class explores speech and motor skills and encourages social development through theatre games and activities. This class spurs physical and emotional self-expression through dramatic play. This class focuses on stretching creativity and bravery muscles through theatrical storytelling. **Must register for Stretching Creativity & Bravery Muscles to be eligible for Exploring Our Voices or Creative Movement. 2 for $100 - or sign up for all three for only $150!